I started attending the various meetings and guest speakers held by the Exercise Science & Sport Management club at Rutgers during the spring semester of my sophomore year. In my junior year, I attended nearly every meeting the club had, helped raise funds, attended two group trips, and brought in one of the club's guest speakers. Starting at the end of my junior year and summer leading into my senior year, I became a member of the executive board for the club. In the fall semester, the board and I put together an Exercise Science & Sport Management Career Fair. The fair consisted of two panel discussions for students, one for sports medicine and one for sports business. There were 20+ vendors in attendance, offering information on graduate school, internships and jobs. Overall, the event was attended by over 300 people from within the school. For the Spring 2012 semester, we have many more events on the drawing table with a schedule forthcoming. If you're interested in more information or speaking to the club, please do not hesitate to contact me from the contact page -- we're always looking for professionals and Rutgers alumni to speak to the students about their experiences in the sports business and sports medicine fields. As a Digital Communication, Information & Media minor through the Rutgers University School of Communication & Information, I was required to do a Capstone project that utilizes the themes, studies, and skills learned from the entire 18-credit minor. 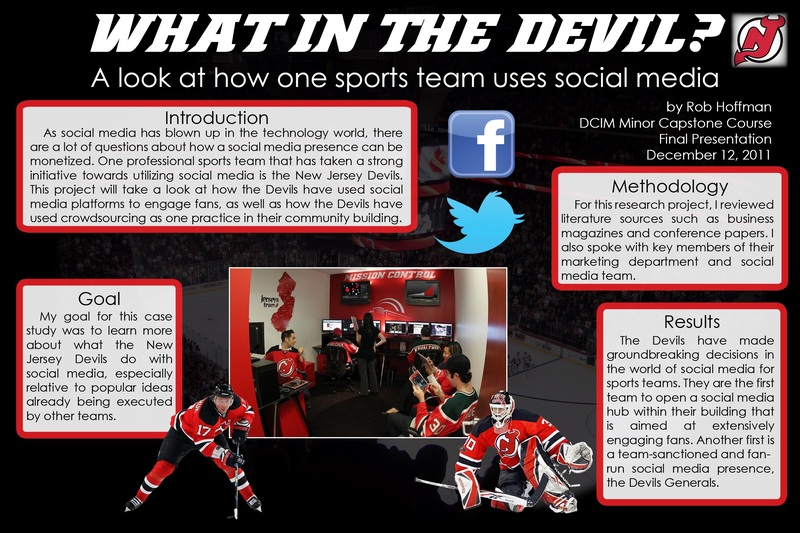 I decided to examine what the New Jersey Devils of the National Hockey League have done in regards to social media, as well as the influences behind their strategies and decisions. Having an interactive and engaging social media strategy has transformed from an advantage for businesses into a virtual necessity. This is especially true in sports where the fans drive the industry. To complete the project, I spoke with key members of their marketing department and social media team and examined studies done about social media marketing and the presence of social media in professional sports. If you would like to see the paper I wrote and the accompanying fact sheet, please contact me; I would love to share it! Here's the poster I presented to the department and my classmates. In the fall of my senior year, I took a three credit class through Rutgers University at Madison Square Garden. The 14-week 10-person class was led by Marcia Steinberg (Director of Group Sales and Services), Adam Campbell (Director of Inside Sales), Sari Brandwine (Senior Account Executive), and Matthew Schulman (Group Sales Specialist). Each class consisted of training in sales techniques, which included but was not limited to the introduction of methods, dissection of the sales process, hands-on training, and role-playing. The class culminated in sales calls as we called and sold tickets to the 2012 NHL Winter Classic Legends Game. As a supplement to the sales class I took in the previous semester, I took another sales training class in the Spring 2012 semester. This sales class was taught at the Prudential Center with the New Jersey Devils as a 14-week class with 19 people. It was instructed by Benjamin Platek (Human Resources), Chris Terwood (Director, Ticket Sales & Service), and Jason Falkowitz (Fan Development Coordinator/New Business Team). This class had a similar format as the previous class in that we were taught the structure of a sale -- speaking to the gatekeeper, breaking through, overcoming objections, and forming credibility statements as a small example. In order to practice our sales skills, we worked hard on advertising the College Nights that the organization was hosting, and we specifically reached out to the Rutgers community to sell tickets.